In this opinion piece, published in Rand Daily Mail, the writer takes issue with Dr Verwoerd's "undignified", "arrogant" and "unbecoming" response to Bar Council chairman IA Maisels's letter questioning the necessity of Nokwe having to take up premises in a "Native area". "DR Verwoerd's letters to the Johannesburg Bar Council over the matter of Mr PPD Nokwe, are just about the most undignified that could have been written in the circumstances. 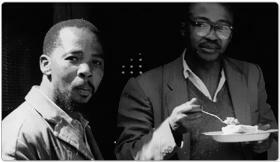 Mr Nokwe, a Native barrister, had been refused permission to occupy chambers in the city. Taking up his case, the chairman of the Bar Council, Mr IA Maisles, wrote to Dr Verwoerd asking for an interview and pointing out that to compel Mr Nokwe to accept premises in a Native area would be to prevent him from practising, even though he had been legally admitted as an advocate of the Supreme Court. "It was a respectful and reasonable letter, to which the Bar Council could have expected an answer on the highest level. Instead, Dr Verwoerd took the evasive course of answering through his private secretary. That in itself seems to show a contemptuous attitude to the Bar Council, whose second letter elicited a still more arrogant reply. To see 'leftist influences' in so responsible a body is to betray a way of thinking that may suit a street-corner demagogue but never a Cabinet Minister. "The tone of the second letter was unbecoming to the head of a Government Department and insulting to the body to whom it was addressed. It suggested, first, that in pleading for Mr Nokwe, the Bar Council might in fact only be trying to protect the interests of certain of its members at his expense, and, secondly, that the Bar Council had become the 'dupe and agent' of political propaganda, 'leftist and other'. "To impute motives of self-interest to the Bar Council is a revelation of the way the Minister's mind works. To see 'leftist influences' in so responsible a body is to betray a way of thinking that may suit a street-corner demagogue but never a Cabinet Minister. It is in fact an infamous suggestion, which implies that Dr. Verwoerd has no real answer to the Bar Council and therefore hopes merely to cow them with abuse."